The members of the “house of representatives” adopted amendments to the Law on mass events at two readings on October 3. The news was spread by the press service of the “house of representatives”. The amendments need to be discussed by the “council of the republic”. The amendments were worked out following successful mass silent actions. The draft law on mass events in the Republic of Belarus prepared by the Council of Ministers provides for asking for permission to hold mass actions and mass inaction. 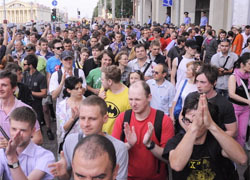 The draft law motes that picket is “joint mass presence of people in a preliminary agreed public place (also, in open air) and at preliminary agreed time for committing a preliminary agreed act that was organized, among other means, with the help of the Internet and other information networks with an aim of public expression of social and political moods and protests”. The draft was sent to the “house of representatives” on July 20 and was on consideration of the Standing Commission on human rights, national relations and mass media. We remind that silent protests in Belarus have been taking part since this summer. Scores of thousands of people took part in protests. About 2,000 people were arrested for up to 20 days for clapping hands protesting against the dictatorship in the country. “Mass inaction” banned in Belarus – Charter’97 :: News from Belarus – Belarusian News – Republic of Belarus – Minsk.